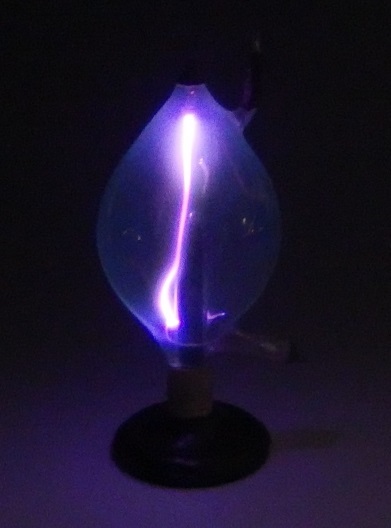 This tube probably contains a gas which a a persistence light when the tube was switched off. Anhydrous sulfuric acid in the tube which is responsible for the effect only worked mostly for a certain period of use. This tube doesn't show the afterglow effect anymore. 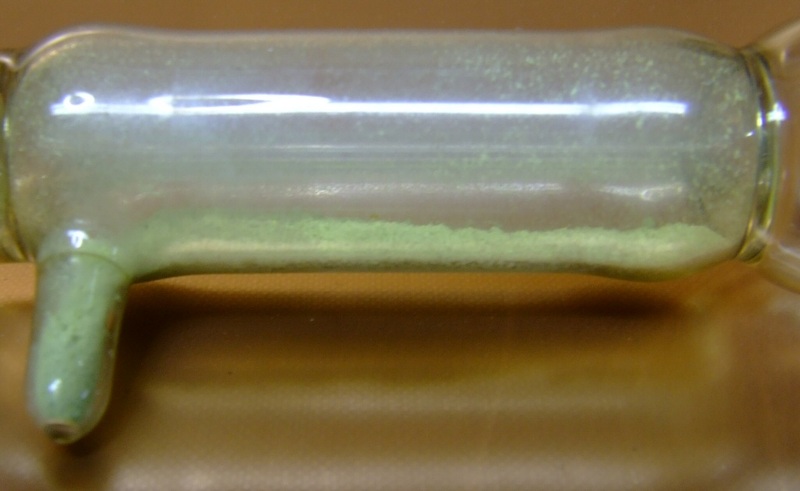 These tubes were produced with different powders, most of them show a colored glow persistence when the tube is switched off In this tube a nice blue color which fades in minutes but it's difficult to photograph see here. 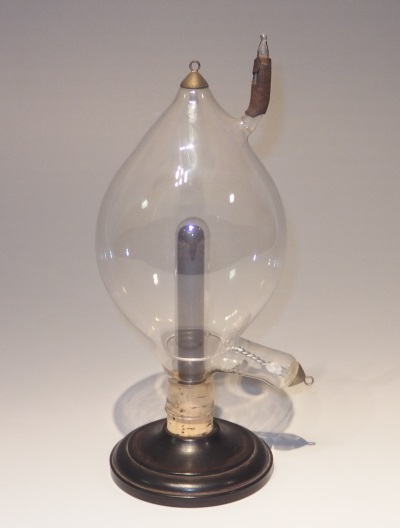 This is a rare 22 cm Geissler tube filled with phosphores powder. 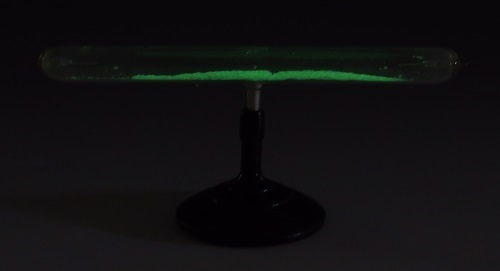 When the power is shut off the powder will glow for a short time. 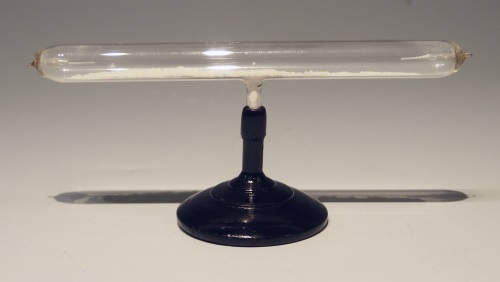 The tube has two chambers with different phosphores powder like Barium or Strontium salts. Here the left and right cavity. 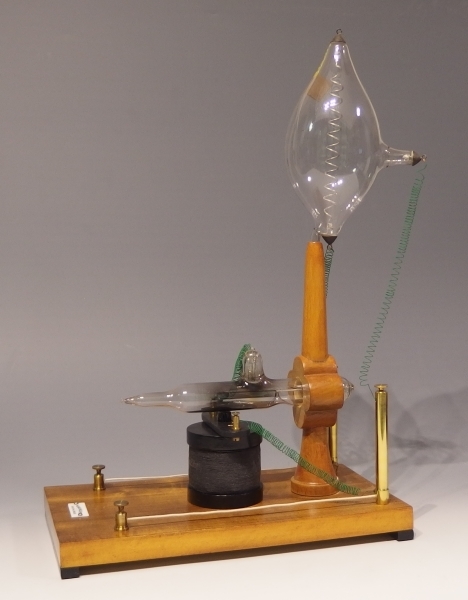 This 30cm tube with platinum wire connections is made well before 1900. When activated in a darkened room you can see gas vapor inside. The tube contains a few drops of oily substance responsible for an afterglow, Probably anhydrous sulfuric acid. The effect is very difficult to photograph but it is great to see it in the dark, the persistence takes a couple of seconds to fade, see last picture. 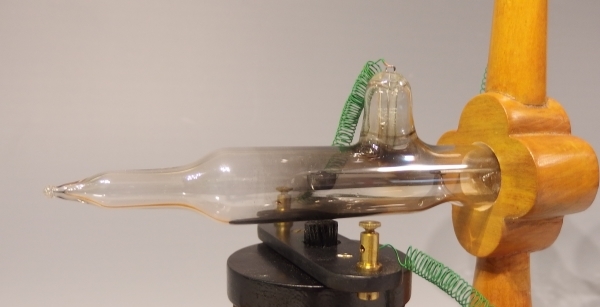 This complete uranium glass tube 30 cm long was used for a setup with an oscillator to measure radio waves by showing standing waves or nodes. This was developed by the German physicist Ernst Lecher in 1888. Setup with an Hertzian spark-gap oscillator. Picture from the Ferdinand Ernecke catalogue 1904. If DC voltage is used, only one arm will discharge depending on the polarity. It's an early form of a modern diode or rectifier. 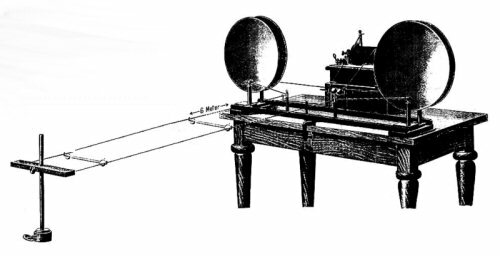 spectroscope. These tubes were used for spectroscopy classroom demonstrations. similar models made for him by Heinrich Geissler. Activated Pressler spectral CO tube. 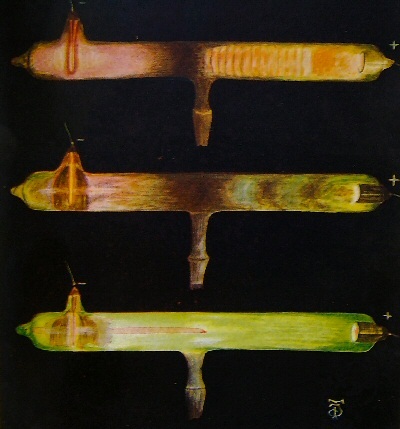 of discharge at different pressures (vacuum) inside the tubes. only the glass emits here the distinctive apple green glow. Sold by the Dutch reseller Salm, the frame measures 30 x 50 cm. Litho of discharge effects at different pressures. The upper tube displays the stratification effect. 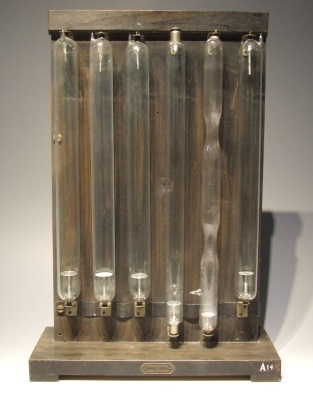 These are tubes after-Gaede who developed a new type of vacuum pump in 1905 on which several different types of discharge tubes could be connected in order to exhaust them. The most famous one is the Lenard tube. Many of these open tubes were sold by the Leybold company. The old catalog can be found at the Max Planck instititute library. 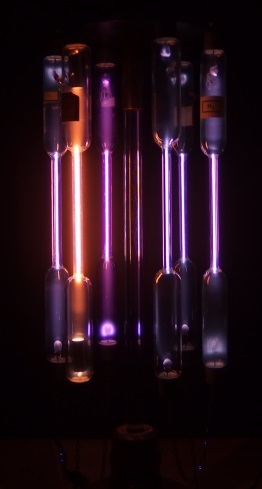 Tube filled with a red substance with an unknown effect. Probably mercury iodide or sulfide, in both cases very toxic! 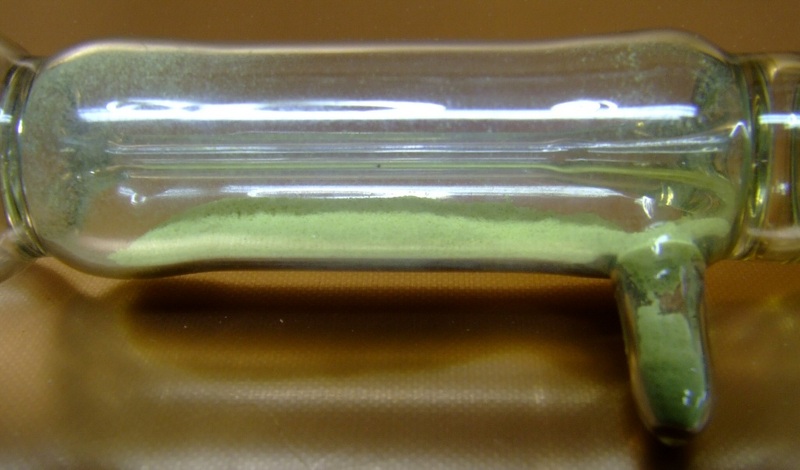 When activated or heated a yellow deposit can be noticed on the inside of the tube which disappears after a while. This tube is used to be demonstrated on top of a electromagnet coil with a low DC voltage. In that case the discharge will turn around the metal rod in the middle of the tube. Depending on the polarity of the electromagnet the discharge will turn clock or anti clockwise. In this tube two types of gasses are separated in two chambers N/CO2. The tube only works on AC or Ruhmkorff coils. Due to the specific pressure inside the tube stratifications are formed. The Mc Farlan Moore cold light tube. with tubing in lengths of several meters. tube run on a simple inductor system. 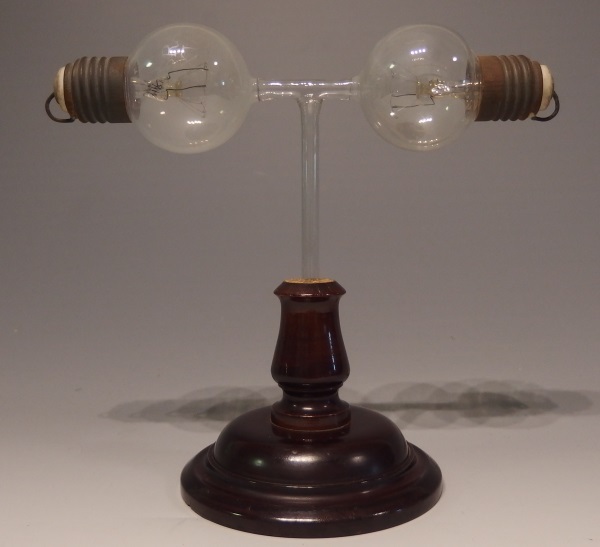 Here a very rare item, the "double lightbulb tube after Greinacher"
This tube is made of two regular light bulbs, in this case Osram Axial bulbs dated internally 1911. 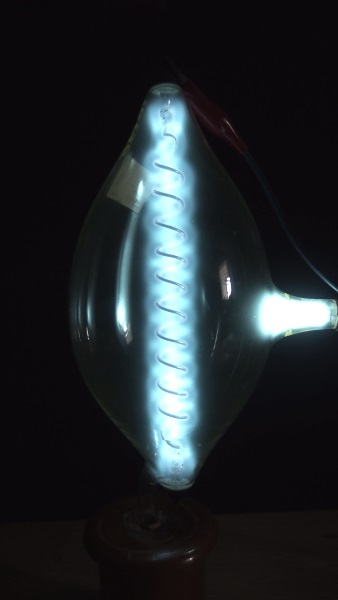 It should work like a Geissler tube when connected to DC only one bulb has a discharge, the filament is shortened and acts like an electrode and shows the production of heat on the filament on the cathode side which will starting to glow. The complete McFarlan Moore setup. 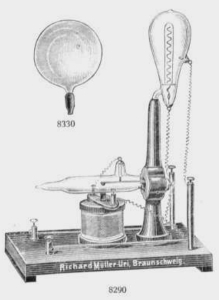 The stand is a replica of the original drawing from a 1909 Müller-Uri catalogue. Both tubes are original antiques. Close-up of the breaker tube.